Saturday, April, 14, 1888 Pleasant, & more spring like. All appear as well with our folk, & of course quite as busy. 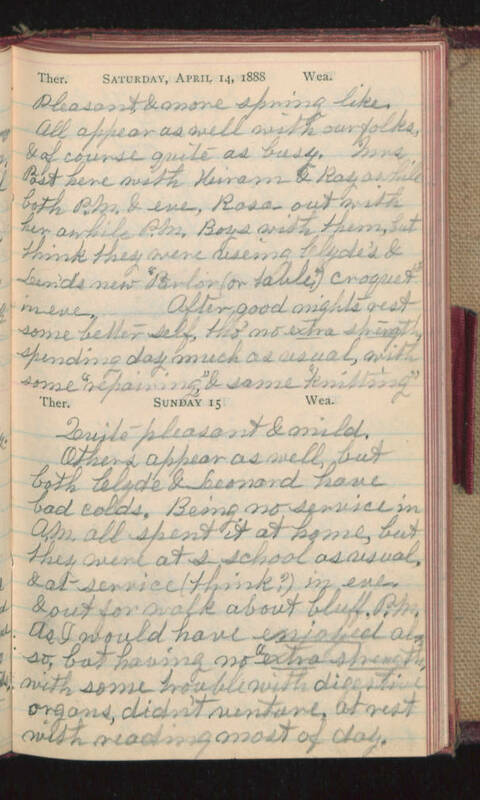 Mrs Post here with Hiram & Ray awhile both P.M. & eve, Rosa- out with her awhile P.M. Boys with them, but think they were using Clyde's & Len'ds new "Parlor (or table) croquet" in eve. After good nights rest some better self, tho' no extra strength spending day much as usual, with some "repairing" & some "knitting" Sunday 15 Quite pleasant & mild. Others appear as well, but both Clyde & Leonard have bad colds. Being no service in A.M. all spent it at home, but they were at s-school as usual, & at service (think?) in eve. & out for walk about bluff P.M. As I would have enjoyed also so, but having no "extra strength" with some trouble with digestive organs, didn't venture, at rest with reading most of day.